Impressive 4 bedroom detached family home in own private grounds just off the Belfast Road. Highly sought after location which is within easy reach of the city centre and all local amenities, walking distance of select schools and provides easy access to Newry's main transport network. Bright, spacious and well appointed living accommodation including two reception rooms. Features reclaimed solid pine timber flooring from the Guinness Brewery Dublin. Well maintained gardens enclosed to rear with patio area ideal for family enjoyment. Hardwood front door and side screen. Feature reclaimed solid pine timber floor. Tel. pt. Feature staircase with carpet laid to leading to first floor. Spot lighting. Coving. NEST heating control unit. 4.38m x 3.84m Feature fireplace with painted timber surround, decorative cast iron inset and slate hearth. Feature reclaimed solid pine timber floor. Main light fitting. Wall lighting. TV pt. Coving. Curtain poles included. Front aspect. 5.7m x 3.54m Solid oak wooden floor. TV pt. Coving. Curtain poles included. Front and side aspect. 3.7m x 2.17m at widest. Fitted high and low level units. Stainless steel sink unit. Plumbed for washing machine and vented for dryer. Tiled floor. Part tiled walls. Coving. Alarm key pad. Gas boiler. Gable window. Hardwood glazed rear exit door. Toilet off with white whb & wc. Tiled floor. Part tiled walls. Coving. Rear aspect. Hotpress. Access to partly floored attic via pull down loft ladder. Carpet laid to floor. 4.28m x 3.53m Master bedroom. TV pt. Tel. pt. Feature dormer window. Gable window. Carpet laid to floor. Front and side aspect. En suite 2.01m x 2.16m White wc, whb & walk-in quadrant shower unit with theromstatic shower fitting. Fully tiled. Wall mirror cabinet. Fan. Velux window. Rear aspect. 3.29m x 1.96m White suite comprises bath with chrome mixer taps and shower fitting, wc, whb with vanity unit, plus separate walk-in shower unit with thermostatic power shower fitting. Fully tiled. Spot lighting. Coving. Fan. Wooden Venetian blind. Rear aspect. 3.76m x 3.23m at widest. Fitted wardrobes. Carpet laid to floor. TV pt. Rear aspect. 3.16m x 3.54m plus recess. Coving. Carpet laid to floor. TV pt. Front aspect. 4m x 3.54m at widest. L -shaped room. Coving. Carpet laid to floor. TV pt. Front aspect. Living accommodation extends to c.161 m2. Nest intelligent heating control system installed. Heating can be operated remotely from mobile devices. 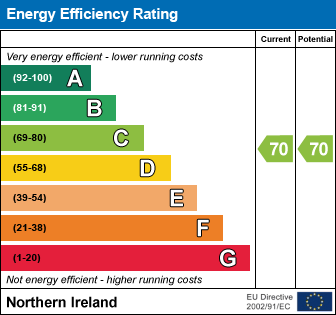 Attic may be suitable for conversion to extra living accommodation subject to building control approval. Well maintained enclosed laid to lawn gardens with patio area. Feature stone wall to front with wrought iron railings and timber entrance gates. House fitted with a security alarm system. Good size rear garden with scope to extend dwelling if required. Freehold tenure assumed, verification required by solicitor.